Megastar Mammootty's upcoming Project '1993 Bombay March 12' pooja held at Avenue centre, Panambilli Nagar, Cochin. The film is based on the real life riot incident and bombings that hit Mumbai on March 12, 1993. The film revolves around the effects of the blasts in the lives of three common men. The film will depict the effect of the incident and the sufferers of that. Noted Malayalam screenplay writer Babu Janardhanan's debut directorial venture, who penned the scripts for some critically acclaimed movies like ‘Achanurangatha Veedu', 'Vaasthavam' and 'Thalappavu'. 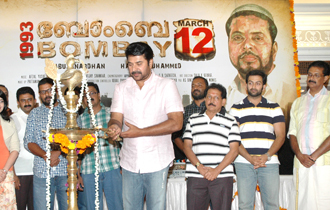 The movie will be made simultaneously in Malayalam,Tamil, Telugu and Hindi.(multi-lingual). The film will be canned in Rajasthan and Kerala locations.